Check the In-Tune Newsletter Archives to see what you've been missing and catch up on what's been happening! You can also subscribe to our free piano newsletter here. May the holiday season bring you joy, happiness, peace, and music! 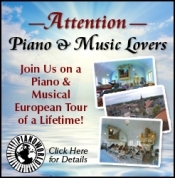 JOIN OUR Piano & Music Lovers European Tour! Tour Some of the Finest Piano Makers in Europe with us in 2011. Get your name on the list now. First payment is due by mid December. If you are planning on joining us, please let our travel agent know. This is your chance to see how some of the world's finest pianos are crafted. Plus it's a chance to meet other Forums Members, tour music museums, visit composers homes, and much more. And of course, it's a chance to see Europe! Let's Talk Cocktail Piano ... (From the same folks who brought you Let's Talk Weddings) What is cocktail piano? How do you become a cocktail piano pro? This thread contains helpful insight from some experienced cocktail pianist, including Robin Meloy Goldsby, author of The Piano Girl. It also has stories from other pianists, hints, instructions, and much more. 12 Finalists Selected for January 8th piano competition in GOLDEN, Colorado. A rare opportunity to hear 12 finalists selected from among this year’s applicants of the 2011 JSIYAC will occur on Saturday, January 8, 2011, at the final (live) round of the competition. Hailed for her “...superstar quality that everybody looks for...Musical, energetic and full of flair,” (The Jerusalem Post), Taiwanese pianist Ching-Yun Hu is a winner of the 2009 Concert Artists Guild International Competition. Helix Aspersa I-V (2008) Graphic scores made in collaboration with snails interpreted using various methods. Ghost House, Oregon (solo piano version) (2010) Indeterminate piece for any instrument, the latest in the Ghost House Series. Grazyna continues her acclaimed “Chopin 200” series with stunning vocal re-interpretations of Chopin’s piano music- this time, in a pared-down format with piano accompaniment only. PianoForte continues its annual tradition of hosting an all-day celebration of Franz Schubert’s music- with over 30 regional musicians performing on three stages. This is a wonderful theater built in 1925, gorgeous architecture. Nate Najar’s annual Christmas jazz concert is a Palladium favorite. This year’s show features swinging jazz, holiday favorites and selections from Duke Ellington’s Jazz Nutcracker. The guitarist and his trio will be joined by a host of special guest artists. $5.00 The SPC Concert Chorus, 140 voices under the direction of Vernon Taranto, Jr., presents its annual: Candlelight Concert A Christmas Season Spectacular celebrating our favorite time of year. NYC Saxophone sensation Harry Allen joins the Nate Najar Trio in the Side Door Cabaret. Swing Bros. recording artist Harry Allen has over thirty recordings to his name. His recordings have made the top ten list for favorite new releases in Swing Journal Magazine's reader's poll and Jazz Journal International's critic's poll for 1997, Harry has performed at jazz festivals and clubs worldwide, frequently touring the United States, Europe and Asia. With children's tickets for only $10, the whole family can come to the HSO's Holiday POPS! Spectacular this Saturday! What is your favorite childhood memory about the holidays? Ticket information is available on their website, www.hartfordsymphony.org, or by calling (860) 244-2999. Unfortunately we've lost another one of our own. "Zeb Billings opened Billings Pianos in Milwaukee, Wisconsin in 1956 beginning a long and celebrated career in the music industry. With great success as a retailer, Zeb branched out into publishing when he saw the need to include packets of sheet music in the bench of every piano sold." Visit www.PianoMother.com or www.YokeWong.net for more details. Hurry, limited time offer! National Piano Travelers Association (NPTA) Anybody know when and where the 2011 meeting will be? As usual I'd like to know who plans on attending the show. If you haven't visited this thread yet, do yourself a favor, check it out. If you have been following it, make sure you catch up with the latest chapters. 55,000+ Forums Members, Over 1.5 Million Posts, and still growing!